IDA has designated Kartchner Caverns State Park as an International Dark Sky Park, the second in the Arizona State Parks system to receive IDA recognition and the fifth overall in the Grand Canyon State. Located between Benson and Sierra Vista, Arizona, U.S., Kartchner Caverns State Park preserves a set of ‘living’ limestone caverns whose known passages total some 2.4 miles in length. The cave was previously awarded “Best Caverns in America” by USA Today newspaper. Today’s announcement highlights the protection of another kind of darkness beyond the interior space of the caverns: the park’s natural nighttime darkness and star-studded night skies. Sierra Vista resident and past IDA President Bob Gent worked with park management, IDA, and the Huachuca Astronomy Club (HAC) of Southeastern Arizona to achieve the International Dark Sky Park designation. Kartchner Caverns State Park is located on approximately 290 hectares (718 acres) bordering the west side of State Highway 90 about one hour southeast of Tucson, Arizona. At an elevation of over 1,370 meters (4,500 feet), the park offers summertime relief from the intense heat of the desert floor below. Park visitors enjoy hiking, wildlife observing, cave exploration, and a variety of education programs. An emphasis on dark night skies is a natural extension of park efforts to create and sustain holistic conservation practices. 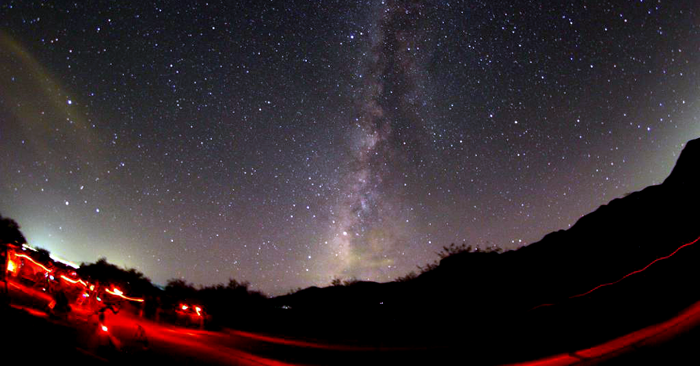 The park is only about 40 miles east of Tucson, putting an authentic dark-sky experience within an hour’s drive for more than one million people in southern Arizona. “The International Dark Sky Park ‘Silver’ designation fits extremely well with the mission and goals of Kartchner Caverns State Park as a Center for Environmental Education,” explained Kartchner Discovery Center Supervisor Jennifer Van Horn. Although Tucson has a good outdoor lighting ordinance, the adjacent Whetstone Mountains block much of the light and skyglow originating from the Tucson metro area. The screening effect of the mountains helps reduce intrusion of Tucson’s light into the park’s nighttime environment. Kartchner Caverns State Park has attracted increasing interest from professional astronomers, the area amateur astronomy community, and the general public. In support of the park’s application for IDA recognition, HAC held a number of events at the park to bring visitors together with telescopes to experience firsthand the wonders of the night sky. The first event, held seven years ago, attracted more than 300 visitors, some of whom traveled from as far away as Phoenix. HAC has also supported an improved outdoor lighting ordinance in Cochise County that surrounds Kartchner Caverns. This ordinance sets lumen limits, requires shielding, uses curfews, and set maximum values for color temperatures. All this reduces glare, limits sky glow, and slows other problems of light pollution. HAC also worked with the nearby cities of Sierra Vista and Benson on their updated outdoor lighting ordinances. Arizona State Parks plans to give high priority to dark skies at its 30 state parks and natural areas. IDA’s application process for International Dark Sky Park certification includes elements such as adoption of park policies that control the amount and type of outdoor lighting allowed on the property. Finally, strong support for dark-skies conservation presents an important opportunity to advance education and public outreach in Arizona according to Dr. Bob Casavant, the Arizona State Parks Manager of Natural Resources, Science, and Research. “Prudent and committed community partnerships continue to assist Arizona State Parks and other resource management agencies in advancing conservation of Arizona’s truly world-renowned night skies, and related successful STEM (science, technology, engineering, math) programs across the state,” Casavant said. To celebrate this award, Kartchner Caverns State Park will hold a ceremony on Saturday, September 9 at 2:00 pm Arizona Time (MST) at the park. HAC will set up solar telescopes for public viewing if weather allows. For more information about Kartchner Caverns, visit https://azstateparks.com/kartchner/.